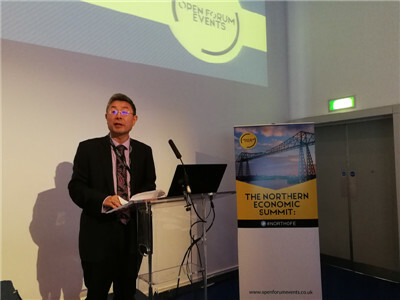 On November 15, 2018, Minister Ma Hui attended and addressed the Northern Economic Summit in Manchester. About 100 people were present, including the Rt Hon. Andy Burnham, Mayor of Greater Manchester, Debbie Abrahams MP of Labour Party, Bev Hurley CBE, Chair of the Institute for Economic Development, Rhys Whalley, Executive Director of the Manchester China Forum, and Andrew McPhillips, Chief Economist of Northern Powerhouse Partnership, as well as representatives from the government, think tanks, universities, business sectors of Northern England. Ma noted in his speech that in the past five years since it was proposed by Chinese President Xi Jinping, the Belt and Road Initiative (BRI) has followed the principles of extensive consultation, joint contribution and shared benefits. It has yielded fruitful results in policy coordination, infrastructure development, trade promotion, financial services and people-to-people connectivity. 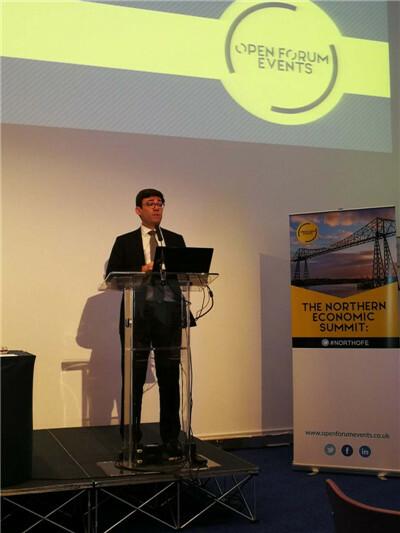 The Northern Powerhouse aims at balancing and upgrading the economic development and pooling the strengths of cities, counties and towns in Northern England in order to enhance connectivity and promote coordinated development of the region. “The BRI and the Northern Powerhouse have similar concepts of cooperation and priorities. Matching these two proposals and enhancing China’s cooperation with the UK, especially with Northern England, will have a great significance to both and present huge opportunities.” Ma said. The Minister shared his suggestions with the participants that China and the UK should follow the trend of the times and work together to promote open cooperation, leverage policy advantages and match development strategies, make good use of the platforms of sub-national cooperation and take concrete steps to promote business cooperation and enhance cooperation on the BRI and open new areas for cooperation. Burnham said in his speech that Manchester is the cradle of the Industrial Revolution. In recent years, it has continuously adjusted its economic structure and promoted its revitalization and development and become a financial and commercial center in the northern part of England. Manchester will focus on key areas such as infrastructure, high-end manufacturing, digital economy, health care, and new energy to promote its economic diversification. It will actively participate in the Northern Powerhouse and strengthen the coordinated development of transport connectivity with neighboring cities, so as to promote a vigorous economic growth of Northern England. As Britain is about to leave EU, Manchester stands ready to open wider to welcome worldwide investors and strengthen economic cooperation with China, India and other emerging markets. At the Summit, the participants had a heated discussion on the issues of leveraging the strengths and unique features of Northern England to strengthen connectivity, achieve balanced and coordinated economic development and narrow regional differences. They spoke highly of China’s major measures in the new round of deepening reform and opening up and encouraged the Chinese companies to actively participate in the revitalization of Northern England. 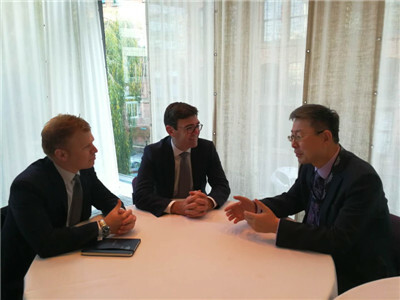 During the summit, Minister Ma had a separate meeting with Mayor Andy Burnham. Ma noted that in 2015, President Xi Jinping visited Manchester during his state visit to the UK, which gave a strong impetus to the cooperation between China and Northern England including Manchester. Since the launch of direct flight between Beijing and Manchester, the people-to-people exchanges between the two sides have become increasingly close and economic and trade cooperation has been accelerated, as more and more Chinese companies came to invest in Manchester and Northern England. He expressed the hope that Greater Manchester would further strengthen connectivity between the BRI and the Northern Powerhouse, deepen the pragmatic cooperation with China in various fields to contribute more “Golden Fruits” to China-UK “Golden Era”. Burnham said that he was deeply impressed during his trip to Tianjin in September this year for the Summer Davos and benefited a lot from the conference. China’s integrated development of Beijing, Tianjin and Hebei offers great reference to the UK. The launch of direct flight between Beijing and Manchester has been hugely beneficial to Manchester. He cited Manchester’s steady economic growth, huge potential and broad prospects and encouraged Chinese companies to invest in Manchester and to strengthen cooperation with local partners in the areas of infrastructure, high-end manufacturing, and digital economy.